Emil Weidner. Courtesy of Raupp Memorial Museum, Buffalo Grove, Illinois. [S107] Arlington Heights Herald, 27 Sep 1946, sect. 1, p. 7, col. 1. [S150] Arlington Heights Herald, 15 Sep 1955, p. 14, col. 8. [S220] Daily Herald, 18 Feb 1994, sect. 5, p. 2, cols. 3-4. [S344] Daily Herald, 03 Nov 1993, sect. 5, p. 2, col. 3. [S772] Daily Herald, 18 Nov 2003, sect. 4, p. 8, col. 3. [S146] Arlington Heights Herald, 25 Nov 1954, p. 10, col. 3. [S229] Daily Herald, 28 Apr 1997, sect. 5, p. 2, col. 5. [S11] John J. Weidner, Compiled Birth, Death, 545 date only. [S229] Daily Herald, 28 Apr 1997, sect. 5, p. 2, col. 5, date and location. 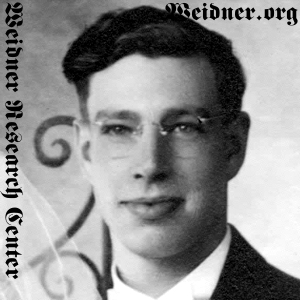 [S11] John J. Weidner, Compiled Birth, Death, 545 date and location.